Across from the gateway to Chinatown on Bush Street, down the steep hill from our hotel, were several restaurants. For our last evening in San Francisco, before renting a car and heading north to wine country, we opted for a cozy upscale dinner at Le Central which promotes being the oldest French restaurant in a city noted for fine dining. 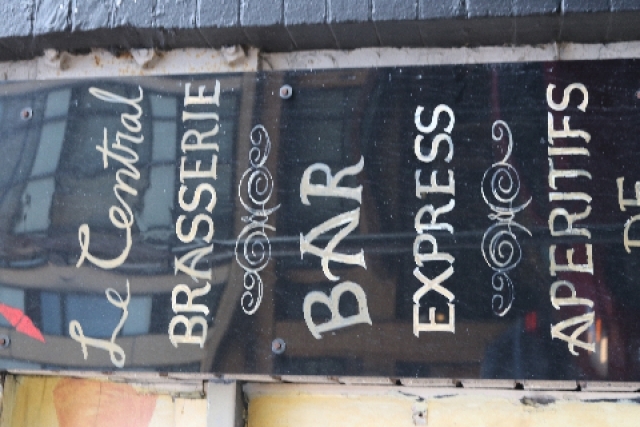 Its web site states that: "Le Central is a neighborhood bistro located in San Francisco's bustling Financial District. 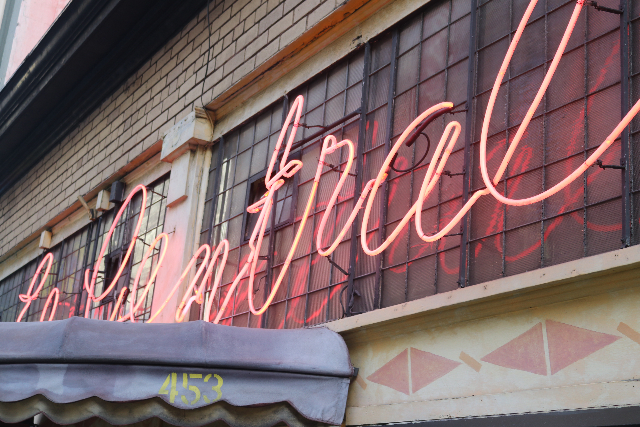 A favorite of locals and visitors since it opened over three decades ago in 1974, Le Central's iconic red tabac sign has become a familiar fixture of Bush Street. Housed in a historic brick building, the restaurant's warm interior offers guests an authentic brasserie atmosphere--including a brass bar top from France that had to be shipped by sea. 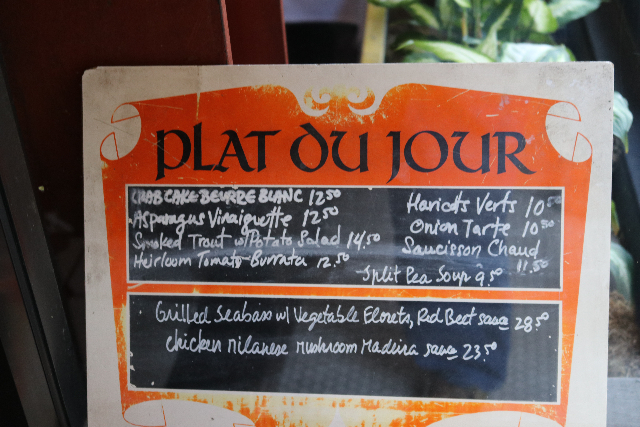 Handwritten chalk Plat du Jour menus and cozy banquette seating greet customers on every visit. “Le Central serves traditional French comfort foods such as Steak Frites, Onion Soup Gratinée, Rack of Lamb Persillé and our cassoulet which has been cooking for over 14,000 days. A hearty bean stew with tender chunks of pork, sausage, and duck confit, Le Central's cassoulet gains its rich flavor from simmering the savory remains of the previous day's stew with fresh ingredients. With a large menu that is available all day from lunch to dinner, Le Central continues to bring the Bay Area quality food. We were worn out from a busy ten days in the City by the Bay and cooked by a lingering heat wave that sizzled as we headed north to Sonoma and Napa. It was a relatively easy walk from the hotel and an opportunity to indulge in culinary tradition. Surviving the tough restaurant business since 1974 says something about the food and service. Arriving fairly early the restaurant, other than a busy bar with merry locals, was relatively sparsely populated. We indicated a choice of seating but the maitre de thought otherwise. It would have been nice to have that deuce in the window which apparently he was holding for regulars. They arrived late in our service. We were shown a blackboard of daily specials. 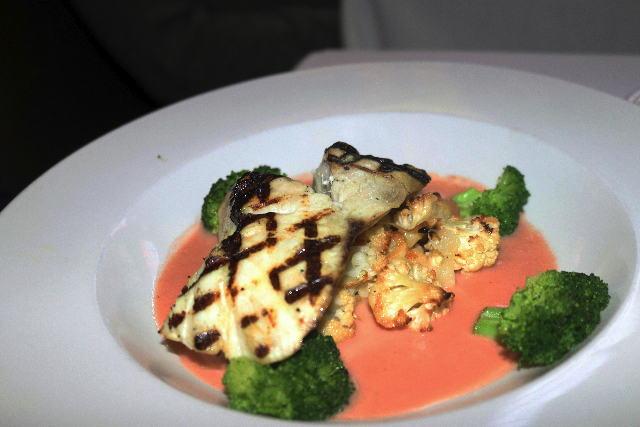 Astrid opted for the sea bass with vegetable florets and red beet sauce ($28.50) She was not disappointed and the fish was delicately grilled to perfection. There was a table of businessmen at the next table and they all appeared to order the cassoulet as well as several bottles of wine. 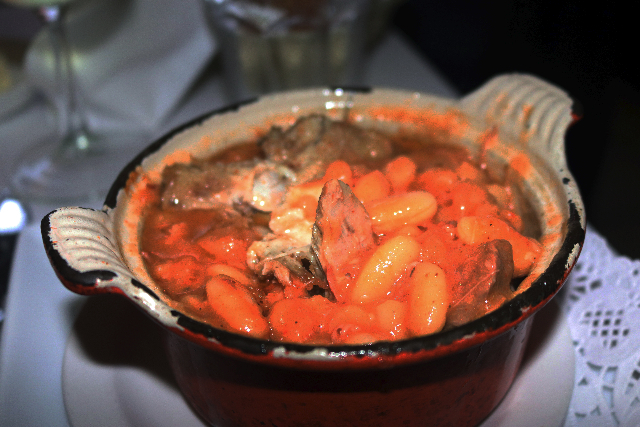 There were enticing items on the menu but cassoulet is such traditional French comfort food. I first tried it in Paris when Pierre and Rosvita took us to a small bistro a short distance from the apse of Notre Dame. He explained the dish to me and it was just wonderful. I have had it since and that Parisian version has been its Platonic paradigm. At Mezze in Williamstown I had a version that was very close to culinary perfection. Noting that I was wavering he added that it had been a house special for decades. We started with an order of mussels to share. There was crisp bread and a generous portion of unsalted butter. With all the fanfare I had expectations for Le Central Cassoulet; white bean stew with duck confit, Toulouse sausage, lamb ($26.50). 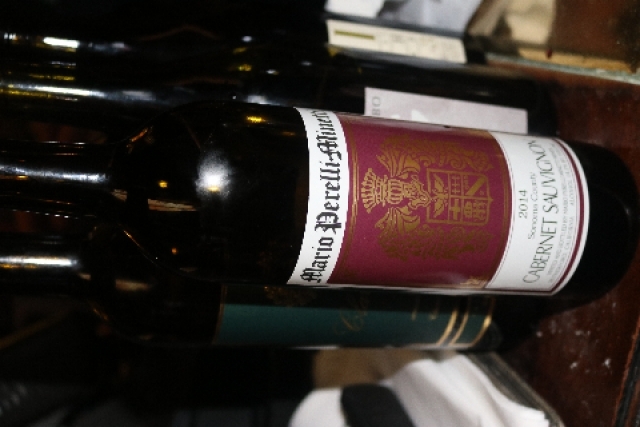 It was satisfying but what one expects for a modestly priced wine jacked up by a restaurant. I followed that with a $12 glass of Sonoma white nicely chilled. Two glasses of wine were the equivalent of my entrée. Which is perfectly fine is the food is good. The cassoulet may be OK for San Francisco but it indeed tasted like a heck of a long way from that romantic Paris bistro. It came in its own small pot. Spooning it onto the plate there was the feeling that it had been sitting around too long. The beans were mushy and lacked flavor. There was nothing left of the overcooked meat. It was impossible to distinguish the duck from sausage or lamb. One sensed that customers order it out of habit and the kitchen has been cranking it out with little attention to quality control. We were in the mood for a special occasion but came away feeling disappointed. Walking back to the hotel there was the feeling that we should have tried the other French bistro.